World War Z finally arrives on the screen after a troubled production history that suggested the film would be as big a disaster as the zombie outbreak it depicts. 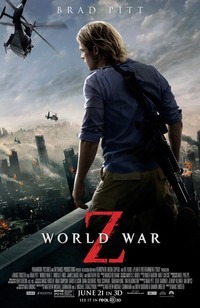 Concerning the efforts of U.N. employee Gerry Lane (Brad Pitt) to get his family to safety in the midst of the global zombie epidemic, and then - via much globe-hopping - to locate its source and cure, World War Z echoes its hero’s motto "movement is life" by largely zipping along at a pace fast enough to excuse its many faults. Even by the standards of contemporary Hollywood blockbusters, World War Z wastes no time in cutting to the chase. World War Z is very much dedicated to placing the viewer in the middle of the action from the get-go, with your reaction to the film likely to be predicated on your feelings towards the dizzying combination of shaky-cam and fast cutting, while Marco Beltrami’s score buzzes and pulsates with a rumbling, immediate sense of menace throughout. The first act evokes the disorientation of sudden and widespread destruction and the subsequent scramble to survive, before the film settles into conventional action fare as Gerry travels across the world, but the action itself is consistently thrilling and tense. Its zombies are hardly as memorable (or as censor-baitingly grody) as the creations of a Romero or even a Fulci, although their swarm-like behaviour is frightening in its speed and relentlessness. Relentlessness is the name of the game as far as World War Z is concerned. The film zips along at a great pace, and this reviewer cannot say that he was ever bored. The globetrotting aspect is original, contributing to this constant sense of movement but never taking the opportunity to present a series of diverse international perspectives on the near-apocalyptic destruction (a central feature of Max Brooks' source novel). Rather, the film cleaves to the viewpoint of its protagonist, its episodic structure contributing to the feel of a kind of nightmare travelogue. The same narrative beats recur at each new destination: Gerry arrives at the exotic location some exposition from a local expert fills us in on the developments in the (barely sketched) investigation before a pulse-pounding set piece introduces the zombies and Gerry’s subsequent escape - just keep moving Brad, keep moving (movement is life, after all). Pitt himself gives a functional performance, devoid of charm or humour, although admittedly the script gives him very little to apply these. By the last act, the pace has slowed enough to give the audience a chance to consider how ridiculous the unfolding action actually is. World War Z is almost aggressively dumb, and one eventually realises that its breakneck pace and breathless action has largely been an attempt to subdue all thought on the part of the viewer, indicative of a paradigm of contemporary Hollywood blockbuster cinema that is getting faster and more furious but providing little other than empty spectacle. The climax contains a moment of product placement so egregious that one can only hope that any and all audiences will erupt into laughter upon seeing it (as mine did). The ending feels tacked-on, and points to the production problems that the pacing and action-staging have done wonders to not make too obvious prior to this. My memory of World War Z is already dimming to a series of "wow" moments, bangs and flashes of spectacle; for this very reason, I know I would have a blast seeing it again. This review was published on June 23, 2013.